Lysine, or L-lysine, is an essential amino acid. That means it is necessary for human health but the body can’t manufacture it; lysine has to be gotten from food. Amino acids like lysine are the building blocks of protein. Lysine is important for proper growth, and it plays an essential role in the production of carnitine, a nutrient responsible for converting fatty acids into energy and helping to lower cholesterol. Lysine appears to help the body absorb calcium, and it plays an important role in the formation of collagen, a substance important for bones and connective tissues including skin, tendon, and cartilage. For years, lysine has been considered in the treatment of herpes and cold sores, and more recently, has been attracting attention as a possible addition to the fast-growing list of muscle-building nutrients. Not enough lysine can cause fatigue, nausea, dizziness, loss of appetite, agitation, bloodshot eyes, slow growth, anemia, and reproductive disorders. For vegans, legumes (beans, peas, and lentils) are the best sources of lysine. 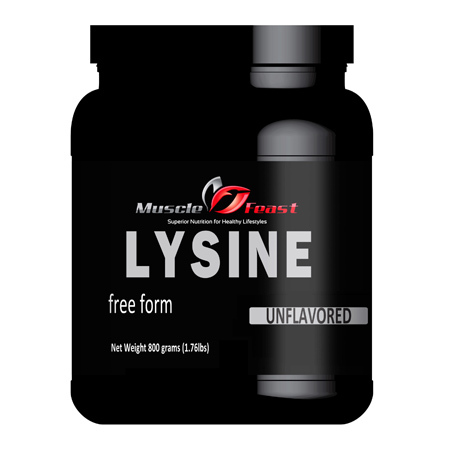 Lysine has been attracting attention as a possible addition to the fast-growing list of muscle-building nutrients. L-lysine is a necessary building block for all protein in the body. L-lysine plays a major role in calcium absorption, building muscle protein, and the body’s production of hormones, enzymes, and antibodies. Lysine appears to help the body absorb and conserve calcium. Lysine has many functions in the body because it is incorporated into many proteins, which are used by the body for a variety of purposes. Lysine may help reduce angina pectoris, chest pain caused by insufficient oxygen in the heart muscle. 5 grams divided throughout the day for this condition. Lysine strengthens the circulatory system and helps the immune system manufacture antibodies. If you feel a virus coming on, for example, you can take 500mg of Lysine every hour for 8 hours or until symptoms desist. Lysine also helps control the body’s acid/alkaline balance, influences the pineal and mammary glands and plays a role in gallbladder function. It is necessary for all amino acid assimilation. Some studies have found that taking lysine on a regular basis may help prevent outbreaks of cold sores and genital herpes. Not every study has shown positive results, however. One study found that taking lysine at the beginning of a herpes outbreak did not reduce symptoms. Lysine helps the body absorb calcium and decreases the amount of calcium that is lost in urine. Because calcium is crucial for bone health, some researchers think lysine may help prevent bone loss associated with osteoporosis. Lab studies suggest that lysine in combination with L-arginine (another amino acid) makes bone-building cells more active and enhances production of collagen. But no studies have examined whether lysine helps prevent osteoporosis in humans. There is a complex metabolic process that governs the formation of collagen in connective tissues, and the amino acid L-lysine is central to the chemical reactions involved. Strong collagenous tissues are in fact a product of derivatives of this amino acid and their metabolites. When a compound containing an oxygen atom bound to a hydrogen atom is introduced to this amino acid, a reaction that brings about hydroxylysine takes place. This of course is dependent on the synthesis of many chemical compounds that are implicated, and the availability of L-lysine, iron, and Vitamin C. Healthy fibrous connective tissues result from, as a direct consequence, the stabilization of collagenous fibers. L-lysine, as an essential amino acid, is not only directly involved in the formation of collagen, which are secreted into the tendons and ligaments, but also affect the proper functioning of many other parts of the human body, making it indispensable as far as the overall health is concerned. Our L-Lysine powder is assayed by the manufacturer to be 99.5% pure, according to HPLC standardized testing methods. It contains no fillers, taste additives, or anti-caking agents. Lysine in the diet is considered safe. High doses have caused gallstones. People with kidney or liver disease should ask their doctor before taking supplemental lysine. Pregnant and breastfeeding women should not take supplemental lysine without talking to their doctor. Recommended doses of L-Lysine vary depending on the health condition being treated. A recommended dietary allowance (RDA) for L-lysine does not exist. The suggested dosage is 5 mg per pound of body weight per day for lysine. If taking L-lysine for medicinal purposes, such as cold sores or cankerr sores, the suggested dosage is 1000mg three times per day. Always consult your doctor first.